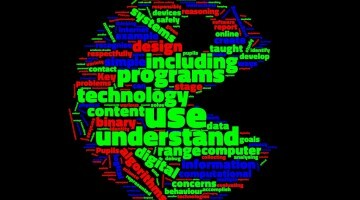 The computing curriculum has been with us for just over a year now. I for one am still guilty of calling it the ‘new curriculum’. This is born out of a realisation many schools are paying lip service to it. Lots of training to support staff in delivering this curriculum is needed. I can only imagine how it must feel to non-specialists, as it would be to me if expected to teach Mandarin having had no formal training in it. I think I would give it my all and read around it as widely as I could, but would find it difficult. 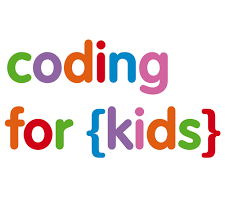 There are many excellent resources available for teachers new to coding and particularly scratch. 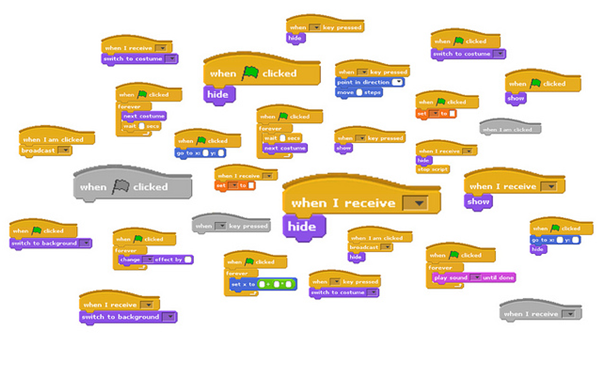 For those of you who are unaware of Scratch, it is a visual programming language devised by MIT in the United States. It works by assembling blocks that trigger actions for a sprite. The blocks are colour coding based on their purposes and only fit together in specific ways. Action blocks can only connect at the top of a sequence. Best of all it is totally free! 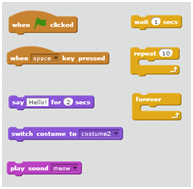 Scratch works by building simple algorithms (sets of instructions to achieve a task). These combine to create programs that are ever more complicated. Children in my school have used scratch to code their own versions of the popular games Pacman and Flappy birds. Way before any of this, children need to become familiar with the families of blocks and what they can do. Some trigger actions; some change the look of the sprite while others can initiate loops or sub routines. They can experiment clipping the ‘actions’ and ‘looks’ blocks to a green flag tile and experiment what happens when they click the green flag. The look of glee on a child’s face as Scratch the cat races across the screen for the first time is something to behold. They can make it say something or play a sound too. Once they have mastered the joining of blocks to create an action they can experiment with loops, variables and broadcasts. The real magic comes when the children are able to ‘apply’ the skills they have learned to design and create their own games bases around the blocks they know how to use. Once you can move a sprite around the screen you can start to navigate a maze. Once you can code a simple timer you can create urgency and excitement. Once you know how to code logical arguments, you can make your character return to the start if they hit a wall or baddie. When you have all of this then you can attach it to an external device and set off lights, buzzers and motors. The most important thing is not to try to be an expert straight away, but to learn with the children. Working out what is going wrong in an algorithm and finding how to fix it is as important as putting it together in the first place. Like with anything the only way to be better at something is to do it. As I said, I am not a fluent speaker of Mandarin, but if I practised and used it enough then at some point I could be. Coding is here to stay, it is time to embrace it and allow the current generation to develop the skills that industry is crying out for. As schools we need to grasp the nettle and have a go. Remember help is usually no more than a click away. Twitter is an excellent source of help for all manner of subjects. Finally, the ScratchEd project is Scratch’s own educational group. They have a wealth of project cards, jargon busters and ready-made displays for you to use in school without cost. The children have never ceased to amaze me with their creativity and ability to problem solve. They are the ones who drive the learning and always want to find out more. My advice is to dip you toes in slowly at first and see If you to get bitten by the coding bug!